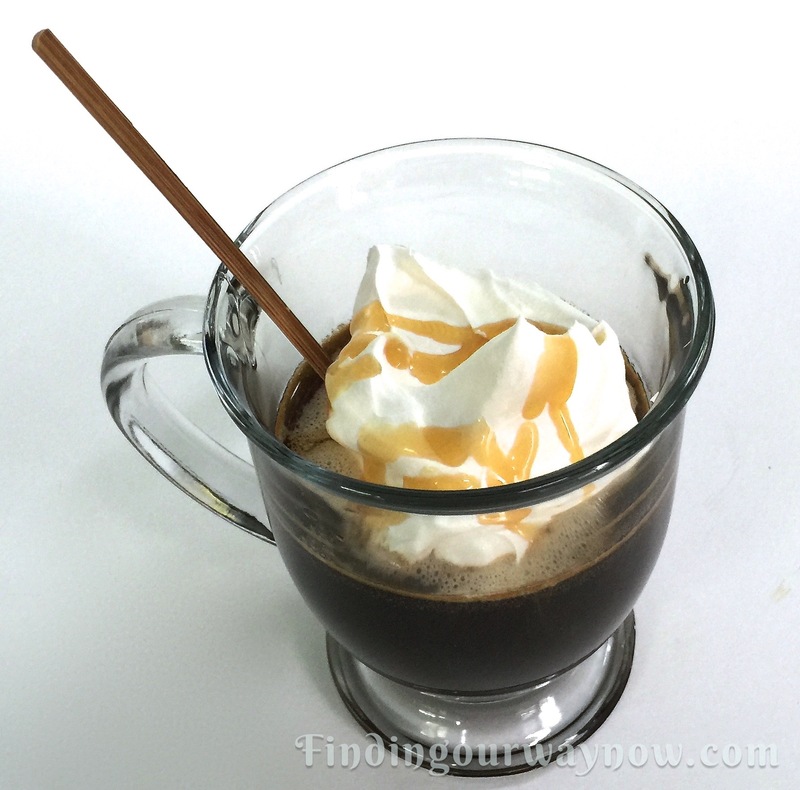 It may be after St. Patrick’s Day, however, there is always space for a fun celebratory beverage like this “Irish Coffee With Honey.” I found this recipe at my favorite grocery store, way before St. Patrick’s Day. I asked the wine/beverage manager about it. He couldn’t say enough about this particular recipe and gave me a few tips. I simply ran out of time to try it, up until now. With a few adjustments, this is what I liked the best. So here you go. Mix the first four ingredients in a pitcher and stir to combine. Take a sip to check for sweetness. Add a bit more simple syrup to adjust to your taste. Pour the mixture, for effect, into two nice clear glass mugs. 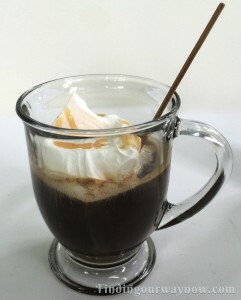 Top with whipped cream and drizzle a bit of honey on top. Serve immediately. Directions: Combine the water and honey in a medium saucepan. Heat to a boil and then let simmer on medium-low heat for about 30 minutes until the honey and water reduce down about half. Pour the mixture into a small pitcher, place uncovered in the refrigerator. Let it completely cool or leave overnight. Notes: The beverage manager recommended that I use Medos Honey Liqueur and Tullamore Dew Irish Whiskey to make this recipe. However, he did say any good Irish whiskey and honey liqueur would do just fine. I also tried this with a brown sugar simple syrup, using the same recipe, in place of the honey syrup, and it was quite good. But why not go the extra mile and make the simple syrup with honey. You’ll have leftover simple syrup; store in the refrigerator for later use. Regardless of the time of year or what you’re thinking or doing, it’s definitely your lucky day when you’re served this extra special Irish Coffee with Honey. It is quite a treat and one you won’t want to miss so give it a whirl. 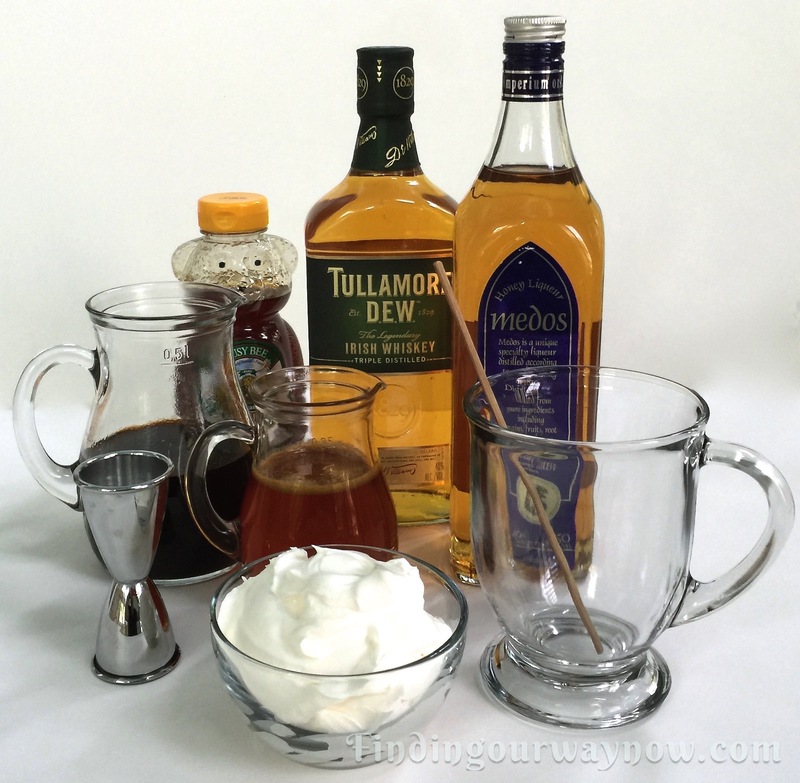 If you liked this “Irish Coffee with Honey,” check out my Original Irish Coffee, Making a Good Cup Of Coffee and Mimosas My Way.